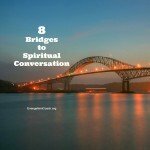 A blog had a great article ( “Gospel Connections in Suburbia“) that has evangelistic conversational tips. How can I take a natural conversation about common things and connect it to the gospel without it coming off like an abrupt topic change? The farther the distance between the subject matter at hand and the gospel, the more abrupt the change.